UPDATE 11/19/18: In light of PG&E's likely role in starting the Camp Fire, this blog about Gov Brown and his regulators' failure to force the utilities to mitigate fire risks is like deja vu all over again. It's time for California's next Governor to part ways with the past. Governor Brown may not have lit the match that set off the recent wild fires in Sonoma and Napa, but he has responsibility for failing to clear the tinder that spread the flames. In an oped in this Sunday's San Francisco Chronicle (which you can read below), I presented the case of how Brown's failure to rein in PG&E, corruption at the Public Utilities Commission and his veto of legislation stepping up clearing of brush near overhead utility lines contributed to the rapid spread of the flames. The significance of Brown’s veto of SB 1463 (Moorlach), which passed unanimously in 2016 following the Butte fires, was called into question by the Governor's office in response to the oped. The bill required updating of fire safety maps that PG&E has been stonewalling for almost a decade through the regulatory process. Those maps determine whether utilities like PG&E have to mitigate risk of fires by clearing brush near overhead utility lines. Reporting by the Bay Area News group Sunday also shows just how significant that veto was. The newspaper group reported that since the 2007 San Diego wildfires PG&E has stalled the creation of new fire maps in the Public Utilities Commission process. SB 1463 would have required completion of the maps and process, including input from local communities about their contours. This bill was neither insignificant nor small. Why would a governor veto unanimous legislation that was unopposed? That’s between Brown and his priest. However, having watched the statehouse for nearly three decades, I can say it’s no stretch that PG&E, which was too embarrassed to openly oppose the bill, whispered in the ear of the Administration. The fact that former PG&E executives were Brown’s top aides made that whisper very probable. The fires that laid waste to California’s Wine Country and at least 42 lives were not merely the product of a changing climate and extra-heated winds. Early reports suggest the failure of Gov. Jerry Brown and his appointees to adequately regulate our public utilities to prevent such fires also fueled the fast-moving flames. Investigators are examining downed power wires and exploding transformers from Pacific Gas & Electric Co., which were reported on multiple 911 calls, by PG&E workers and by witnesses as the immediate cause of many blazes. Reports from fire responders, residents and PG&E itself also point to the flames spreading so quickly because of overgrown trees too close to the utility’s power lines. The Butte Fire in 2015, which destroyed more than 500 homes and killed two people in Calaveras County, was caused by PG&E’s failure to cut back a pine tree that hit a power line and sparked the fire. PG&E’s negligence to identify the weakened trees led to bipartisan legislation in 2016, passed unanimously by both houses of the Legislature, to reduce the risks of wildfire from overhead utility lines by clearing out dead trees. 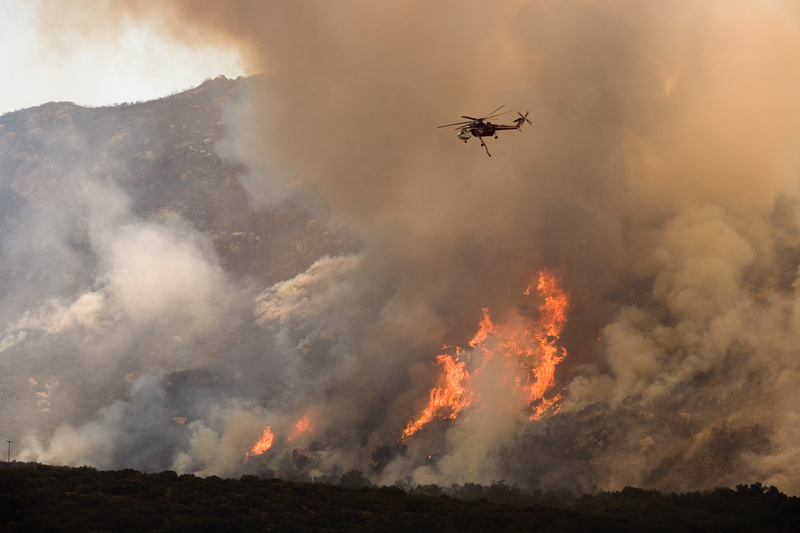 The bill required the Public Utilities Commission to identify and map high-risk wildfire hotspots due to overhead utility lines, taking into consideration local governments’ concerns, so that utilities would have to step up their mitigation efforts in those areas. Unfortunately, Gov. Brown shockingly vetoed that fire prevention legislation, claiming that the state Public Utilities Commission and the California Department of Forestry and Fire Protection had a process in place. The furious spread of fires along trees in the path of power lines last week lays naked that claim. Unfortunately, cronyism in the Brown administration has allowed a long-standing culture of neglect at PG&E to continue undeterred because PG&E and its brethren fear no real consequences. PG&E has long been the darling of the Brown administration, supplying his top aide, Nancy McFadden, from its executive ranks, as well as his former Cabinet secretary. It’s little wonder the unanimous fire cleanup bill was vetoed when McFadden, Brown’s top legislative adviser, was a former senior vice president at PG&E who left the company with a $1 million payout. The veto came despite the fact that explosive electric power equipment is among the top three causes of California wildfires. Brown has also stacked his Public Utilities Commission with PG&E and utility partisans in the wake of corruption scandals that should have shaken the commission to its core. We often think of public corruption as an academic, antiseptic issue. In this case, it has real-world consequences. Brown’s refusal to get tough on PG&E and other utilities has led to repeated safety issues that endanger lives. Consider the San Bruno explosion in 2010 that claimed eight lives and leveled neighborhoods. PG&E neglected gas pipelines and kept shoddy maintenance records. It even took ratepayer money intended for gas pipeline repairs and used it for executive bonuses and shareholder dividends. Emails showed PG&E’s lobbyist worked surreptitiously with PUC commissioners to pick its own PUC judge to hear the case. It took a federal conviction this year to reveal PG&E was a criminal. City officials in San Bruno still wonder why no one at the company was ever punished. Under PUC President Michael Picker, a top former aide of Brown’s, the commission continues to stonewall the release of documents related to the blast. Of course, PG&E has been generous to Brown and his causes as well, shelling out six-figure contributions over his term. The irony is Brown has made combatting climate change his signature issue, but his hostility to regulation has made California more vulnerable than ever to its ravages. That’s a lesson the next governor should learn as prerequisite for the job.